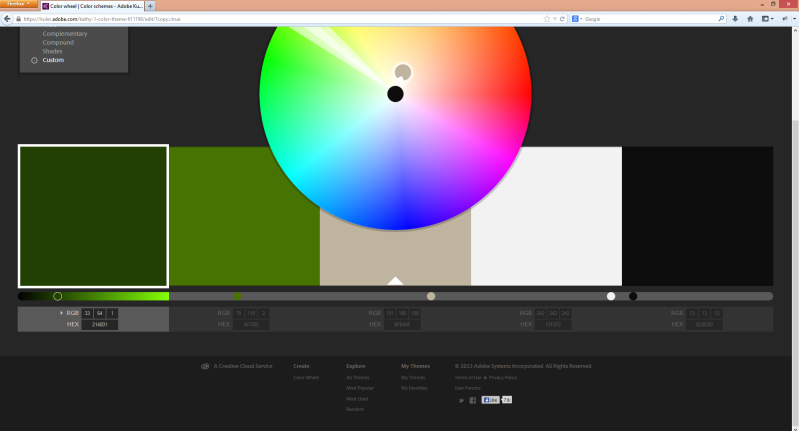 I’m going to select three to use, but you can have as many colours in your palette as you need. The dominant colour that will be used as the background colour will be the middle colour in the screenshot, which is a kind of a grey. The subdominant colour will be the lighter green, this is the 2nd from the left in the screenshot. This will be used for copy text etc. The accent colour will be used to highlight things, for this I’m choosing the off-white. 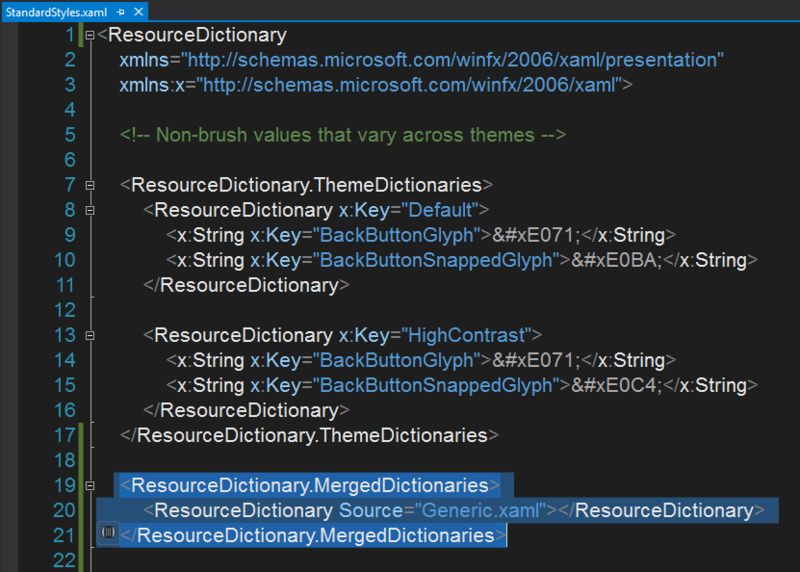 In XAML, resource dictionaries are places we can put things (such as styles, etc.) that can be reused throughout our app. 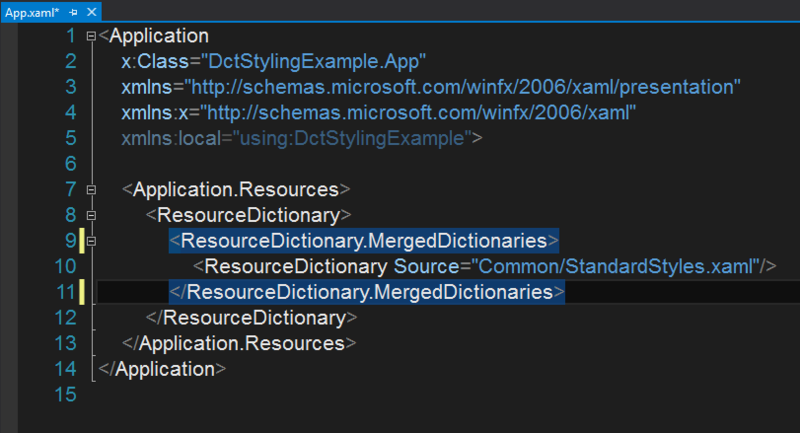 Using the Visual Studio template we get a StandardStyles.xaml file created for us in the Common folder. We could go and restyle all the styles for all the default controls by hand, but this is not much fun. Or we can use a handy open source utility called HAMMER.Pants. This is a command line tool that we can give a colour and it will spit out a xaml file with all the 4802 lines of standard control themes but using a colour we supply. So if we use out subdominant colour (green-ish) we’d execute: “hammer.pants.exe /colour=467302” where 467302 is the RGB hex value (again we get this from Kuler). 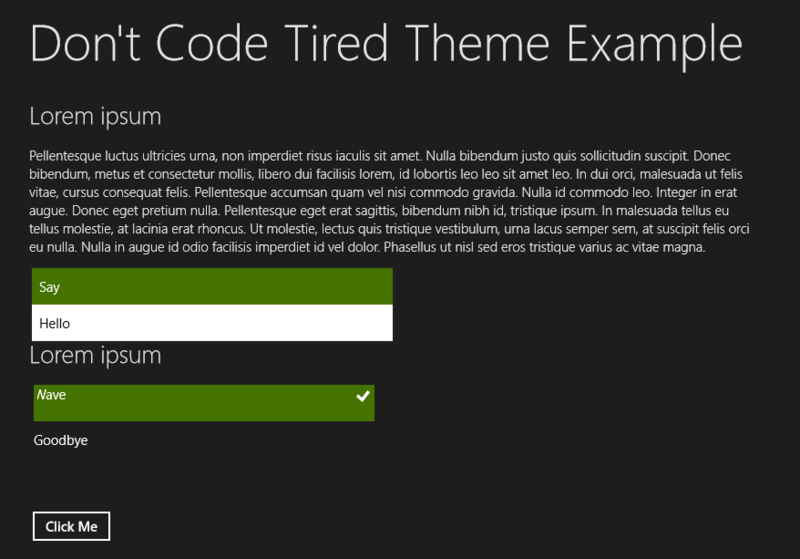 This will generate a Generic.xaml file for use. Now we have our controls styled we want to override some other things such as the background colour. 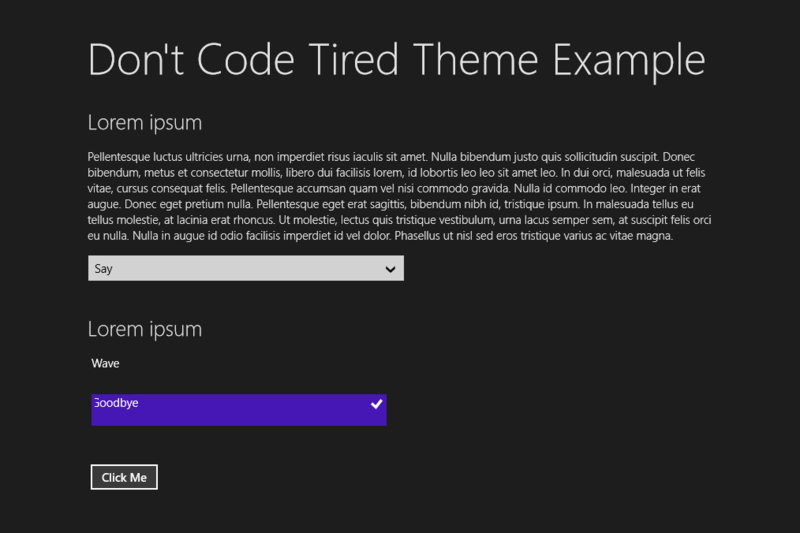 First we need to make use of our Colours.xaml file that we created earlier. 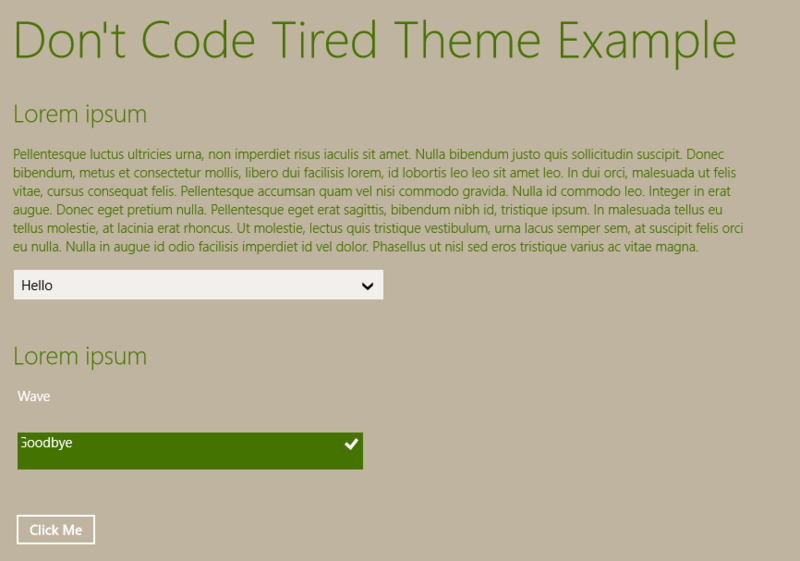 Now we can start to redefine some of the default theme things. These override the ApplicationPageBackgroundThemeBrush to our dominant colour and the ApplicationForegroundThemeBrush to our subdominant. No offense but this post feels incomplete and the result looks hideous. I know that you were trying to teach a technique but given the fact that you made a Pluralsight course to introduce people to design I expected a bit more work into this post into bringing the final result to something that looks at least as good as the starting default example if not better. Instead this final screenshot looks hideous and with poor color contrast. I would love if you would be willing to edit this post and continue the application of the colors from the kuler scheme to the example project until it looks like something that is more complete and with the change of colors tone if there is a need in order for it to look better ( or perhaps this could be an idea for another blog post and you could plug your course as a means to learn more about design and making choices like these that you made while making the example have a better design ). Hi David, thanks for the feedback. Yeah, I was focusing on the technical technique rather than aesthetics but I could have chosen something prettier! I do have some more design-focused post ideas to write up in the future, including color choice, etc Thanks again, Jason.